Use these ideas to improve your cucumber crop productivity using cucumber net as crop and vegetable support. The great advantage of using HORTOMALLAS netting for your tutoring of cucurbitaceae plants is an improved phytosanitary conditions as compared to raffia, thanks to improved aeration and decreased contact with the workers´ hands, as these are a vector for disease transmission and mechanical stress. HORTOMALLAS is the most used cucumber trellis net available on the market because of its ease of use and durability (it lasts many cycles therefore allowing its already low cost to be distributed over many crops, also allowing crop rotation). Curbits like cucumbers will grow upright thanks to the natural attachment system these plants are provided with, the rotating tendril as this will allow it to pull the plant upwards and stay away from the ground with the humidity it stores. Humidity as we know entices the formation of fungi which are harmful to the cucurbits. 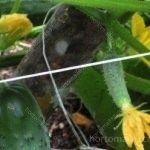 Tendrils will find a firm support in the trellis netting and climb on to its structure and allow the cucumber plant to develop fully, maximizing its yields and fruit baring capacity.